In the fall of 2013, the Durham Parks and Recreation (DPR) Outdoor Recreation unit in N.C. became responsible for Durham Lakes—two bodies of water in northern Durham County: Lake Michie, a 480-acre lake fed by the Flat River, and Little River Reservoir, a 1,158-acre lake fed by the Little River. Each of these lakes is highly treasured by the community, and both are hidden gems for people living in the city and surrounding areas. The lakes are open four days per week—Friday through Monday—from mid-March to mid-November. Lake Michie, which runs shallow with numerous inlets to explore, draws bass fishermen from all over North Carolina, southern Virginia, and South Carolina. Little River, with its cool, deep channels (the main channel is 80 feet deep), brings in the crappie and bass-fishing crowd. When the Outdoor Recreation unit assumed management of the lakes upon the retirement of the previous manager from DPR’s Cultural Heritage unit, it was a natural fit. Outdoor Recreation staff members are passionate about the lakes and use them often for canoe and kayak programs, as well as for family fishing events. The lakes are co-managed by the Outdoor Recreation unit and the city’s Water Management department. In assuming responsibility, it was important for the unit to manage the expectations of the people who had a vested interest in the lakes, including Water Management, surrounding communities, lakes users, and staff members who transitioned with the shift in management. Water Management provides funding for recreational operations on the lake and monitors water quality and environmental concerns that might impact the city’s drinking water. DPR manages lake operations for recreational purposes, including permitting and boat rentals. Although co-management can have its operational and budget challenges, it also has many benefits and opportunities, and is achievable only with good relationships and open communication. For example, after Outdoor Recreation assumed management, a fleet of kayaks was provided at each lake. With a coordinated marketing strategy that included social media, the lakes began to draw in the 18 to 45 age demographic, a group that was not previously taking advantage of the lakes in large numbers. This strategy led to a rise in rentals; in fact, they doubled from the previous year. With more lakes users, additional staff members were needed. Outdoor Recreation worked with Water Management to add a part-time position to support the existing lake attendants, as well as to enforce lake policies. Other expectations surfaced from both the lakes’ users and staff members, chief among them concerns about deferred maintenance, access, and user fees. Listening became a priority, and determining how to properly address these issues was extremely important. People living near Lake Michie have a high sense of ownership, in part because some of them are related to people who built the dam in the 1920s. Many community members are also enthusiastic anglers who line up at 3 a.m. on opening day to ensure a morning on the water. Skepticism often arrives as a companion to change, and that was the case for Outdoor Recreation in the first few years of managing the lakes. DPR built solid working relationships with the local bass-fishing clubs and the fire department, creating an information hub that helped disseminate details about the lakes to the community. Long-term staff members—some of whom had been working at the lakes for 20-plus years—had concerns similar to the users, but also brought useful insights into the decision-making process. Hosting a full-house community meeting at Lake Michie in spring 2017 to discuss upgrades to the lake operations and listen to concerns. Additional partnerships were fostered within the city to make added improvements, including working with the General Services Department to resurface the dock at Littler River and redesigning the Lake Michie dock. Lake Michie is currently undergoing construction to add a boat house that will have a new ADA-accessible deck on the front of the building, a new dock and walkways with handrails that meet ADA specifications, and an ADA-accessible canoe/kayak launch. These renovations will allow even more individuals to use the lakes; with this continued partnership, DPR hopes to continue to make more improvements to the lakes. 3. Refacing of the deck with composite planks and ADA features, such as a lower railing and wheelchair bump-outs at the end of the dock to make fishing easier for people with disabilities. All of the work was scheduled for completion by the end of December 2016. However, Hurricane Matthew paid North Carolina an extended visit, dropping almost 10 inches of rain in 48 hours and causing a significant change in plans. Lake Michie is fed by the Flat River, and the flooding was significant and terribly damaging. The existing dock took the brunt of the damage because the current blasted whole trees and debris into the north side of the dock, jamming the debris underneath the dock and causing pilings to break and the ramp access to partially separate from its connection point. There was an immediate danger of the 5- to 6-ton dock breaking loose and making its way over the dam. Park maintenance mobilized quickly, securing the dock with a length of 15,000-pound aircraft cable connected to two 5,000-pound blocks of concrete. As the damage was assessed and the contractor was consulted, the city project manager and the architect for the project knew the dock’s structural integrity had been compromised and that the dock would need to be replaced rather than upgraded. It would take nearly a year to secure the additional funding and permits for the project. The original scope of work was $245,300, but with the new work that would be required, those costs had risen to approximately $381,000. The demolition and removal of the dock structure and the demo and replacement of the boat-house deck and upgrades were completed before Lake Michie opened for the 2017 season. The project moved slowly through a redesign and re-permitting process until, finally, a “go” date of October 24, 2017 was set … then it stopped raining. After five months of drought, the rains finally came and the lake waters rose enough to float a barge which allowed the contractor to drive the piles for the dock. 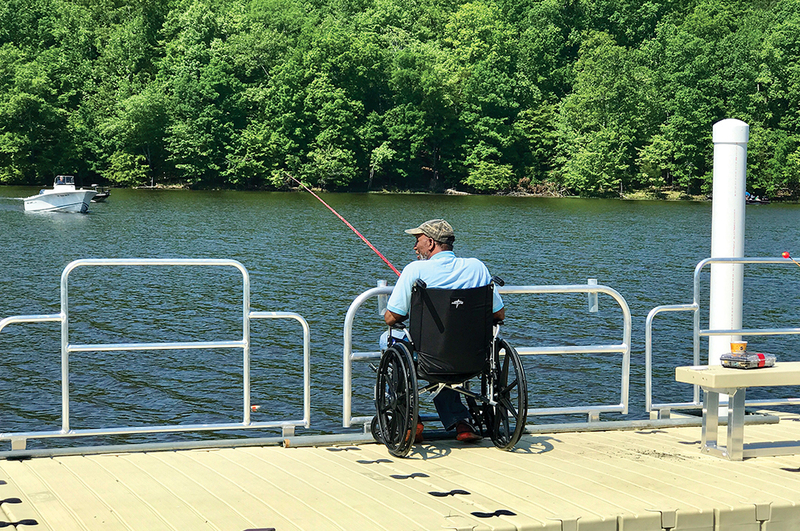 After a long-anticipated installation, a dock and accessible canoe/kayak launch was in place the first week of April, just before the Lakes Season Opening Celebration event. A debris screen, designed to deflect debris away from the dock, followed soon after to prevent the damage that occurred during Hurricane Matthew. Customers are quite happy with the upgrades and often comment on the new level of service. Kim Oberle is the Recreation Manager (Outdoor Recreation, City Lakes) for the city of Durham in North Carolina. Reach her at Kimberly.Oberle@durhamnc.gov.